Watch the birds on East Harbor. Plenty of windows from which you can enjoy the view! 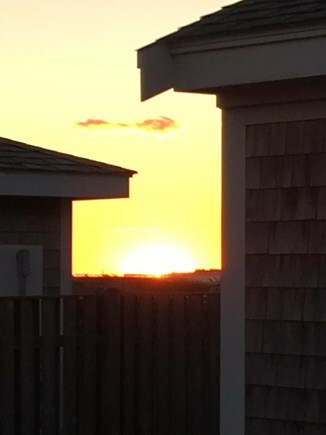 Sunset over Provincetown from kitchen landing. 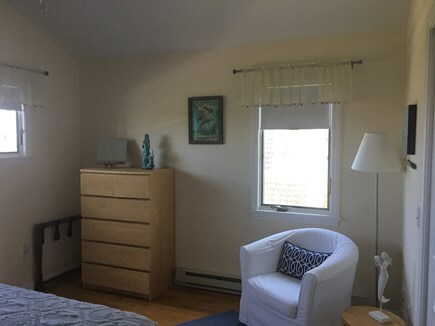 Queen bedroom: ceiling fan, view of East Harbor and dunes. New construction, new furniture, new everything in 2009! In 2017 we've upgraded and updated items as needed, and it all still feels new. 180-degree view of the National Seashore Dunes and East Harbor from the huge front windows, deck and front bedroom. Enjoy your coffee or cocktails from the living room or in the warmth of the sun on the deck. Watch the sunrise and sunset, count the stars. 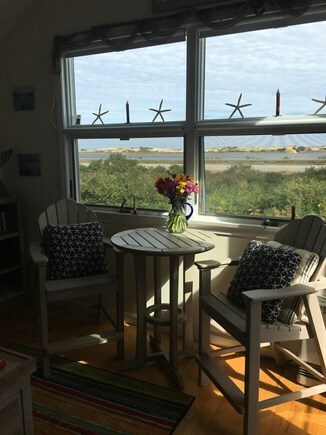 Catch a peek of the bay and Provincetown from the back bedroom and the kitchen porch. Beach chairs & umbrella, as well as bar height Adirondack chairs and table. Weber propane grill. Outdoor shower coming this spring! 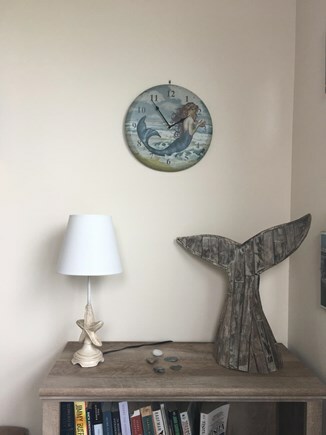 3 miles to Provincetown center (MacMillan Wharf), 2-6 miles to ocean & bay beaches, 1 mile to free Truro public beach with free parking. Feel the salt air from the bay across the street. 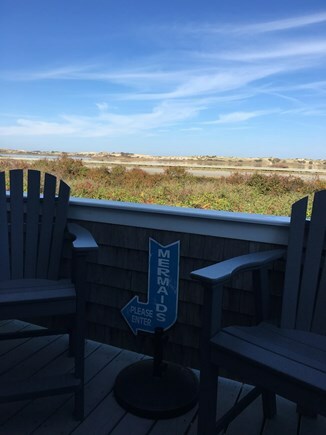 Fall asleep to the waves on a quiet night, surrounded by sand, beach grass & beach plums. 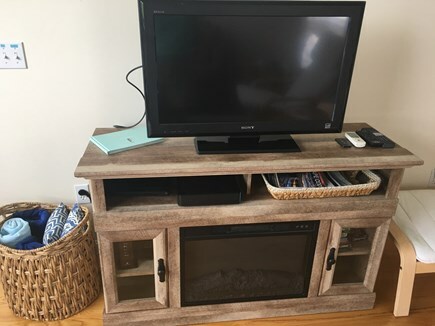 Indoors: 32-inch flat screen HDTV with cable, high-speed wifi, cards, games & books. DVD player. Plug your laptop into the TV to watch your Netflix (bring a VGA cable). The spacious, airy open floor plan allows everyone to do their own thing and hang out together without feeling cramped. Loaded kitchen, full size everything: microwave, dishwasher, blender, coffee grinder, coffee maker, and crockpot. 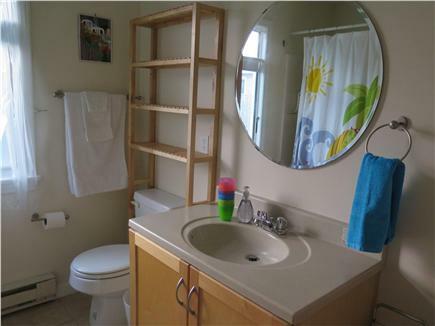 Dishwasher and hand dish soap and coffee filters included. Paper towels, paper napkins, dish towels, pot holders, all sorts of gadgets to make your vacation easy. Dining: the table seats four to six, with two expandable leaves. Tablecloths, cute serving dishes, and plenty of bowls and platters provided. Service for 12 (dinner & salad plates, bowls, flatware, mugs). Tons of glasses - acrylic and glass: wine glasses, beer mugs, pilsners, margarita glasses, kids' plastic cups, gel-filled glasses you pre-freeze, which keep your drinks nice and cold. One bedroom has a queen bed, the other has two twins. All have memory foam toppers that can you can remove if you prefer a firm mattress. The sofa easily pulls out to a full/double bed, with mattress better than most sofabeds. 2 blankets/bed (including the sofa bed), bedspreads, pillows, beach towels, and clock radios. 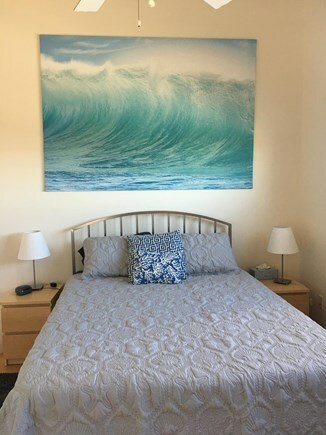 A full-size washer/dryer makes it quick and easy to have fresh clothes for dinner and nightlife in Provincetown or Truro, and clean beach towels for the next day. 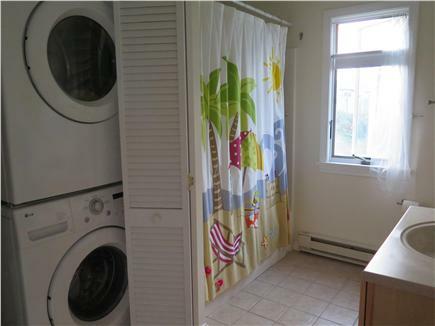 Wet bathing suits can hang on the drying rack or the extra shower curtain pole over the tub. 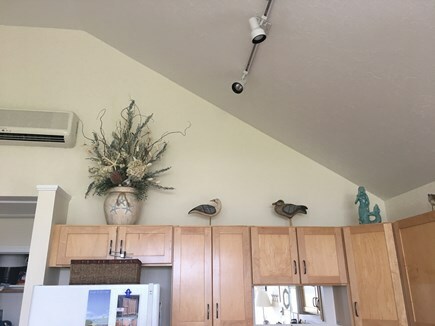 High ceilings with ceiling fans and central air conditioning, plus a standing fan you can move where you want, keep you cool. Separate heat in each room keeps you warm in the spring and fall. The blackout shades on all windows (even the really high one) let you sleep in late, while the airy curtains let light in while maintaining privacy. 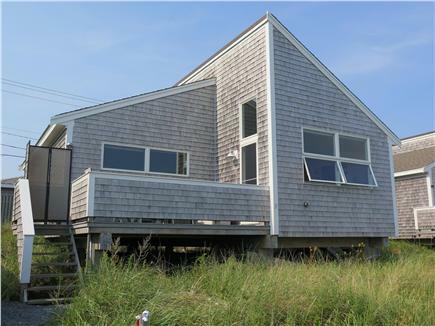 Both doors have full windows (also with shades) and screen doors for you to enjoy the breezes and light the Outer Cape is famous for. The lock is a combination lock, so no need to fuss with keys; the combination is changed each week. 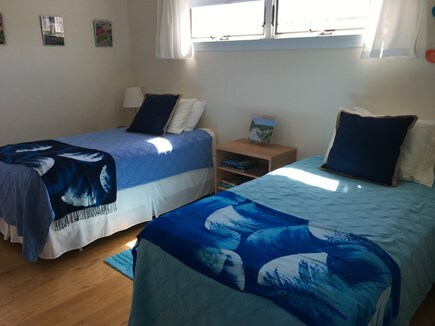 2 parking spaces; room for kayaks, bikes and beach toys around the cottage. 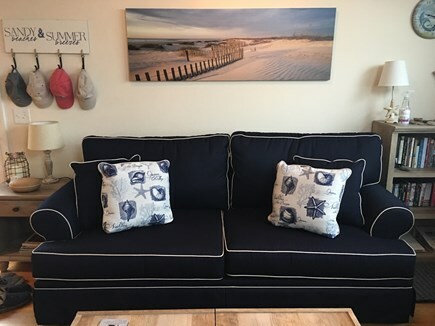 We'd love to come have you relax and enjoy your Outer Cape vacation in this fresh new cottage! Additional availability info: Well heated & insulated for spring and fall vacations. This is a Sunday to Sunday vacation rental. Additional pricing info: $75 discount for 2 consecutive weeks ($100 if booked before April 1), State and local taxes of 12.45% will apply. Eight outside steps up to main and only floor. Great stay!! Very comfortable amenities! 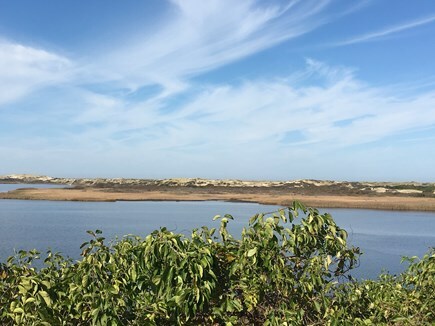 Views of the dunes and East Harbor are amazing!! Cocktails on the patio are great!! Close to the beaches. On the bus route and an easy Uber to P'town! !